A new "funny" has come to town, and it even has a funny name: The Ladybroad Ledger. The inaugural newsprint compilation features 10 artists and a broad range of subject matter, from a Finnish pie recipe to a comical rendition of the Second Amendment to funeral planning. Organizer Stephanie Zuppo, a 26-year-old web freelancer and cartoonist based in Winooski, launched the 12-page publication to showcase the work of female-identifying cartoonists. She wants to counteract the notion that only men make comics. "There are female creators. There are nonbinary creators," she says, "and I want people to know our names." Zuppo plans to distribute 2,000 copies of Ladybroad around the state this month. So far, she's left copies of the free newsprint comic at the Fletcher Free Library in Burlington, Scout & Co. in Winooski and other locations. She posts each new drop-off on the publication's Instagram account. A formal release party will take place on Saturday, March 4, at Burlington's Generator, where Zuppo is a member. The compilation, which Zuppo aims to publish twice a year, has an unabashed feminist spin. And, although it's in black and white — with a red-hued cover by Glynnis Fawkes — the comic is a welcome bright spot in the current political climate. Ladybroad carries on the tradition of women's comics that began in the 1970s, explains cartoonist Rachel Lindsay (whose work is published weekly in Seven Days). Those alternative publications by female artists countered the notion of a comic-book "boys' club" and "satisfied the need to play back the female experience in America within the genre," she says. These days, gender disparity in comics is declining, according to Zuppo, an MFA graduate from the Center for Cartoon Studies in White River Junction. "It's becoming more balanced, especially in alternative and indie comics," she says. "Now, a lot of the major publishers are taking notice and hiring more women." That doesn't mean female cartoonists should kick back and declare victory any time soon, adds Zuppo. "I still think featuring women in comics is an important thing, and it should be done more often," she asserts. The women in Ladybroad make a strong entrance. The dramatic political cartoons of Michelle Sayles balance complex pieces such as the diary-style entries of Iona Fox (who also appears in Seven Days). The latter is a farmer and naturalist; her visual explorations of interpersonal relationships are excerpted from her self-published book Almanac, which chronicles a year in her life. Julianna Brazill contributes an educational piece that illustrates the root systems of aspen trees. And then there's Lindsay's "Clif and Luna" comic. The inventive protagonist imagines Clif and Luna bars in a relationship involving meditation circles, mountain adventures and heartache accompanied by the appearance of Luna's ex, Power Bar. Zuppo's piece explores her experience planning a male relative's funeral. A funeral director connives to extort a bigger payment from the family by pitching a more "manly" — and expensive — casket. The cartoonist asks both the director and the reader, "So, just what determines a casket's gender?" Fawkes' cover is the darkest piece of the bunch, metaphorically speaking. 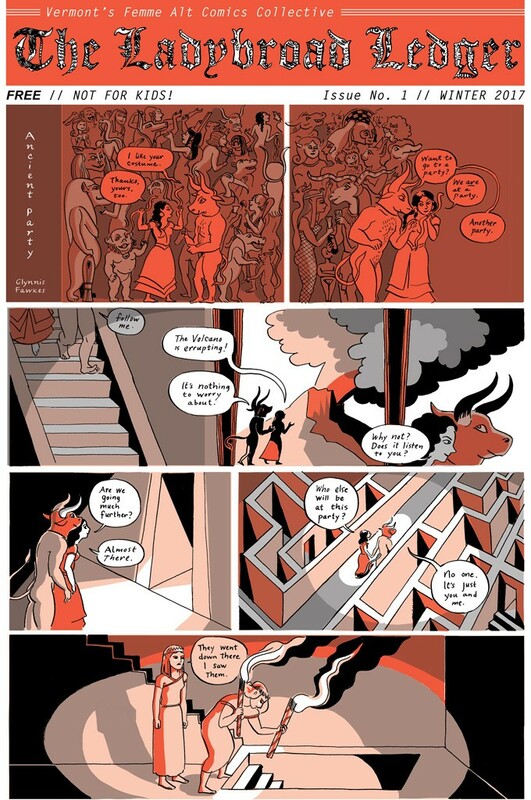 It depicts a girl being led into a maze by a Minotaur — or perhaps a man wearing the head of a bull. In an interview on the back cover of Ladybroad, Fawkes says, "I wanted the comic to be about searching for something ... maybe it can stand as searching for a return to light in an awfully dark place." Zuppo says she values diversity of expression and didn't set any parameters for themes. "I'm not sure that I'm going to add any to the future issues," she says. "I kind of like letting people do what they like doing. [It's] just such a wide variety of contributors." Lindsay likes the multifarious nature of the publication, as well. "I also feel a specific power in comics right now, as there is an increased urgency for a diverse means of self-expression," she writes in an email. "And as we get into subsequent issues," Lindsay continues, "I see Ladybroad becoming a powerful platform for female cartoonists in Vermont. Our first issue was compiled before this political shift that is clearly happening. I'm excited to see how the change we're experiencing will unfold in comic form." The artists in Ladybroad certainly aren't afraid of getting messy or diving deep. "A lot of people think comics are just funny kids' stuff, you know?" says Zuppo. "[But] comics can go into some really serious issues." The Ladybroad Ledger can be found in select local libraries and shops. Follow it on Facebook and Instagram, or email ladybroadledger@gmail.com. Free. The original print version of this article was headlined "Women's Issues: A Femme Comic Book Debuts in Vermont"